Live video stream from the International Space Station in 3D showing demo by Astronaut Ron Garan. Hollywood's cheesy 3-D extravaganzas may soon pale in comparison to getting an immersive view of floating in and around the space station. That's because an astronaut has created the first live-streamed 3-D video in the history of space exploration with a shoebox-size camera. 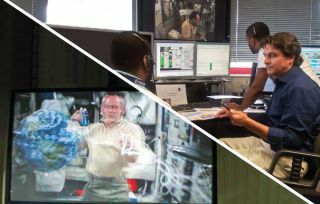 But it's not just entertainment; the 3-D experience might even help mission controllers get a better sense of what's going on with space operations. "The camera could also be used in the future outside the ISS to support the astronauts' spacewalks or other critical robotic operations," said Massimo Sabbatini, a coordinator for the Erasmus Recording Binocular (ERB-2) camera. "This really felt like being in space with an astronaut by your side." But the Aug. 6 test marked the first live transmission test of the second-generation camera. The first ERB-2 images from that will soon go up on ESA's YouTube 3-D channel. "If you already have a new generation 3-D-enabled plasma TV at home, you'll be able to immerse yourself in the world of the space station without leaving your sofa," Sabbatini said. "These videos will turn more people into real space fans."